View of Aberystwyth. James John Hissey in his ‘Old Fashioned Journey through England and Wales’, published in 1884, wrote the following lines about the town. 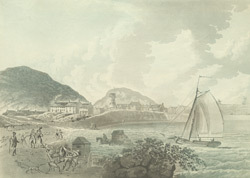 ‘As we saw it then the town looked very beautiful…The portion of the town facing the sea puts on a fair appearance, but the streets in the rear did not please us so much… Aberystwith is finely situated in the centre of Cardigan bay, and faces due west, and is well placed (as the Americans would say)…No doubt as a seaside resort Aberystwith has its advantages, the bracing yet not too bleak or cold west wind is the very thing for certain invalids, and for others who come for pleasure and a change there are the usual watering-place dissipations to be had, though I should judge of a somewhat mild and innocent sort’.